Discussion in 'Early CJ-5 and CJ-6 Tech' started by 3b a runnin, Dec 16, 2018. I have read almost all of the thread on steering swaps and upgrades. Great info there. Thanks to all who posted. I still have a couple questions. I am going to try a power Saginaw swap onto my 3B, at the same time I'm doing a swap from the f134 to a Buick v6, with a t15. 1. I hope to swap from my current D25 to a D30 in the future. I have 2 on hand. Still trying to decide on ratio. Not quiet ready yet. Is there any noticeable difference in the location of the steering box for a d25 vs the d30? Will I have to move the box when I upgrade to the d30? 2. I understand what the term "bump steer" means. I have driven off road with manual steering! I read in the steering thread about the need to set up your new steering to help eliminate bump steer. I guess the question is, what are the steps, or tricks to help with this? I'm sure I will have more questions in the future. I wouldn't even have these Jeeps running without you guys. 1. Probably not. Your drag link may need to be changed out though, depending if there is enough adjustment available in it. 2. Bump steer is when your drag link and tie rod are not parallel at their normal static state. If your drag link is at an angle, when you hit a bump, the axle will move straight up, but your drag link wants to move in an arc around the TRE at the steering box. That point is rigid, so it will push the steering arm on the knuckle outward, jerking the tires to the right on compression and left on rebound. When the drag link is horizontal at rest, the arc still is in effect, but its impact isn't noticeable since its range of travel is just before and after the horizontal plane. As long as you design your setup to have a horizontal drag link, you won't have noticeable bump steer. 3b a runnin, Tom_Hartz, Twin2 and 3 others like this. I did some extensive coverage concerning CJ-3 Saginaw swaps over here. It covers installing genuine Jeep CJ units....both the manual and 800 series power boxes. Frame horns and both D25 D27 or the D30 front axles. I believe the steering mods begins on page 3. 3b a runnin likes this. WOW guys thanks for the info. Both you guys have a way with words. I really do have a better understanding about this. That's ammo for the brain. Not original thoughts but input from knowledgeable members here and my own experiences. I would encourage you to sort out and go with the D30 at the same time. With your 25 you'll have to get either a 2 hole knuckle or the tre that accepts the drag link tre for the passenger side. All trash when you go D30. Just trying to save you some rework hassles down the road. 3b a runnin and ITLKSEZ like this. I already have the 2 hole rt knuckle on the D25. It seemed no amount of work on king pin bearings, wheel bearings, rebuilt Ross box, etc. would stop the wobbles but the 1 piece tie rod with 2 hole rt knuckle did the trick. But its time to move on now. I'm still looking for a rear axle with maybe 4.88 gears instead of the 5.38's I have now. That way I only have to regear the D30 1 time. From input of others and yourself, it does look like I will have to change the pitman arm when the d30 comes along. Tim In case your interested I have OEM NOS 4.88 gear sets posted on Craigslist. Just trying to sort out the hoses on the Saginaw box and on the pump. The steering gear is from an S10 pickup and the pump is ????? My phone wont send a pic for some reason Box has a small and larger port. Isn't the smaller one normally the pressure port? Larger one normally the return. Pump has a threaded port and a permanent tube or pipe. 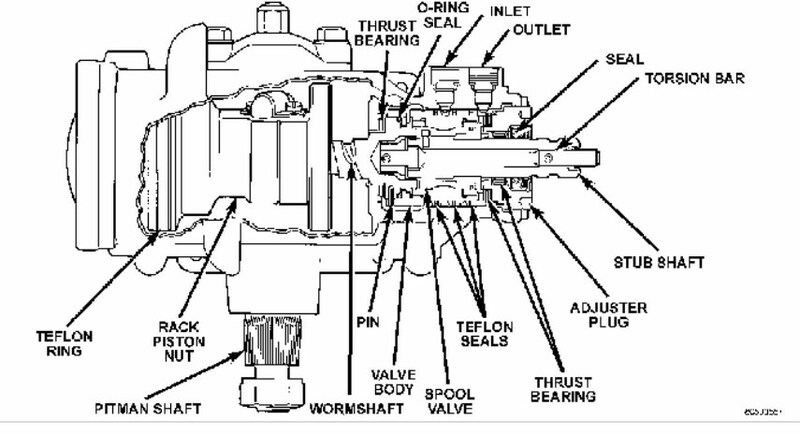 Is the threaded port, the pressure side of the pump? Box has a small and larger port. Isn't the smaller one normally the pressure port? Larger one normally the return. Been working on the steering swap, the best I can with a bum Lt hand. Outside of frame bracket or plate. Buildflycrash, Bowbender, Twin2 and 2 others like this. Thanks My plan is to swap out the D25 for a D30, but that will be a later project. Hoping not to need to change a bunch of stuff. I have the D30 on hand, but it will have to be regeared. I set the motor in the 3B this eve. Nothing is anchored yet. Looks like I'm gonna have about 3/8 clearance between the steering shaft and the ex manifold. During normal torque, and rotation the motor will rock away from the shaft, right? Since I'm asking questions, and you guys always have good answers. Is there any reason that its a must to use a fan spacer on the water pump on a Buick 231? I have about 3/4 in clearance in between the crank pulley, and about 1 in between the fan and radiator with the motor in the current position. I've run a spacer on them to get the mechanical fan within a finger of the radiator. Keeps the air flow good on it, but you have to watch the hoses and tank top (if you have it) for engine roll. My custom radiator on the '50 has side tanks on it to help with it. If you ford deep water those fan blades will distort enough to eat the radiator. Give you one guess how I know this. Steering shaft looks good, mines about the same. Got some parts in and been working on the steering project. Came out pretty good on this direction. Really the only choices that were available thru Parts Mike were, 2in drop pitman or strait. I was afraid the strait one was too much. Had a little trouble with the tie rod hole in the pitman. Wasn't reamed deep enough. Had to take a Dremel and a stone to get deep enough for the nut to keeper. I might have some bump steer in the opposite direction. Maybe a tie rod flip and the strait pitman would be a better choice. Personally, I'd leave it unless it bugs you. There's not enough suspension travel there to get enough of a swing for noticeable bump steer. A straight pitman arm will most likely be longer and might contact the tie rod. Thanks. I guess I'll have to drive it to really put it to the test. I was hoping for a more level drag link, but that didn't happen. A pitman with 1in drop would have been perfect, but I couldn't find one. I should have got the pitman arm before I mounted the box. Hind site is truly 20/20.